When you start-stop your air compressor with right procedure, you will free from many breakdowns. Because every machine has its own procedure of start-stop. During my service engineer job, I had visited many engineering firms all over India. Very rarely I had found right procedure to Start-Stop the Air Compressor. The common picture I saw everywhere was when I asked an operator to start the compressor, he just goes to main switch and press ON button. The operator never looks, whether the compressor is in unloading mode or not, service valve is open or not, cooling water is flowing or not, nothing. Likewise, when I asked to stop the compressor, he just put the main switch OFF. No due care is taken to start-stop the reciprocating air compressor. This is not the proper procedure of start-stop the compressor. You can achieve the best performance from your compressor when it is operated by a right procedure. This is the machine which may run for several weeks without stopping. Many Engineering units run their compressor for a week without stopping. This much performance can be achieved when you have the right information about start-stop of a compressor. All utility engineers, an operator will have to read this article carefully. Here I will share the most important information with you, follow it and you will avoid many problems due to wrong start-stop. 01) Keep Air Compressor at unload condition by use of unloaders. If you are using electro-pneumatic controls, put control supply ON of unloader unit. 02) Turn on cooling water to remove airlock from water cooling system. Check inlet water pressure and flow. 03) Ensure belt wheel is free to rotate by rotating it by hand, for several rotations. This tip is particularly useful when you are starting compressor after a very long period. 04) If force feed lubricator if fitted, check the oil level and operate it for 8-10 turns so oil will reach cylinders for initial lubrication. Check oil level in the crankcase and top up if required. 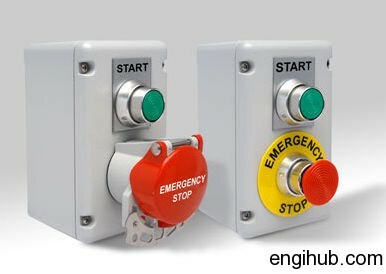 05) Check the position of safety shut down switches. It should be in normal working condition. 06) Drain Condensate from Intercooler & After cooler by opening valve manually. 08) Check the position of the stop valve, open it, to flow compressed air to a receiver. 09) Start Air compressor by pressing ON button from a control panel. 10) Check oil pressure with a pressure gauge. If not shown, stop the unit immediately. 11) Check oil flow from each lubricator pump. Three to four drops/revolution is sufficient. 12) Put Compressor at load condition after 3 to 5 minutes of normal operation. 13) Regulate water flow to cylinder, intercooler, and aftercooler if required. 14) Check Inter stage Pressure. It should be within range. 15) Check for leaks in air, water and oil pipelines. If found any leak, rectify immediately. 16) Check voltage available to each terminal and current drawn by the motor. It must be as per requirement. 17) Check Discharge air temperature. The maximum discharge air temperature allowed is 170-degree centigrade. 18) Drain condensed water from air receiver, pulsation bottles, and moisture separators. Keep the valves slightly open. 19) Check for loose nut and bolts; tighten if required at regular intervals of running operation. 20) Check for unusual noises. Don’t avoid any abnormal sound it may lead to the major breakdown. 01) Unload Air compressor by using M-type unloader. If you are using electro-pneumatic controls, put toggle switch at unloading position. Allow the compressor to run for 5 minutes in unload condition. 02) Press OFF push button to stop electric motor. 03) Shut off the cooling water by closing water inlet valve. 04) Drain condensed water from collection points. 05) Discontinue Power supply to a starter. If you follow above precautions of start-stop, your Air Compressor will give you best performance for long period. By following above start-stop tips you can increase the efficiency of the compressor also.